An open floor plan and an abundance of windows create horizontal spaciousness, while cathedral and tray ceilings add vertical volume to this three-bedroom family home. The formal foyer, punctuated by elegant interior columns, leads to a spacious great room with fireplace and a light-filled octagonal dining room beyond. The kitchen receives definition from columns and features a pantry and angled countertop with a liberal breakfast bar. The bedroom wing hosts a master suite with double door entry, cathedral ceiling, patio access, walk-in closet, and lavish bath. 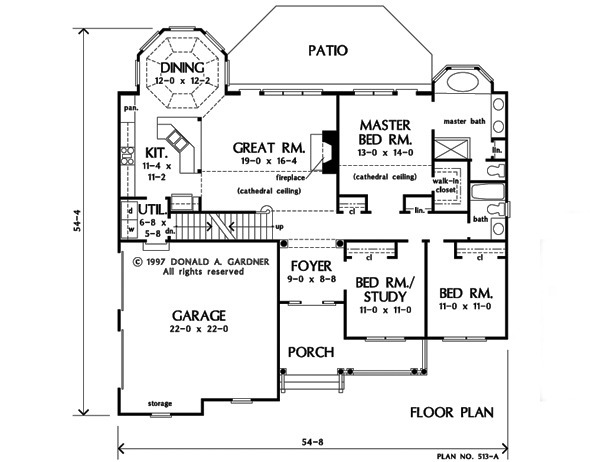 Two additional bedrooms share a hall bath, and bonus space above the garage provides extra room for storage and expansion. 1st Floor: 1695 Sq. Ft. 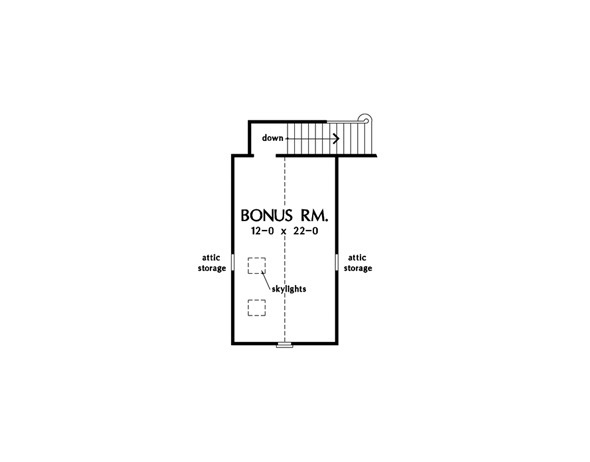 Bonus Room: 287 Sq. 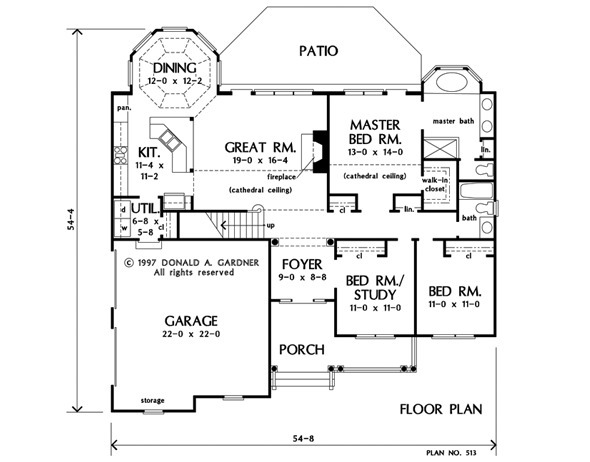 Ft.
House Dimensions: 54' 8" x 54' 4"
Great Room: 19' 0" x 16' 4"
Bonus Room (Cathedral): 12' 0" x 22' 0" x 10' 10"
Master Bedroom (Cathedral): 13' 0" x 14' 0" x 15' 6"
Bedroom / Study : 11' 0" x 11' 0" x 8' 0"
Porch - Front : 20' 8" x 5' 0" x 0' 0"
Deck / Patio : 28' 0" x 12' 0" x 0' 0"
Foyer : 9' 0" x 8' 8" x 9' 0"
Dining Room (Tray): 12' 0" x 12' 2" x 10' 0"
Great Room (Cathedral): 19' 0" x 16' 4" x 16' 1"
Kitchen : 11' 4" x 11' 2" x 8' 0"
Utility Room : 6' 8" x 5' 8" x 8' 0"